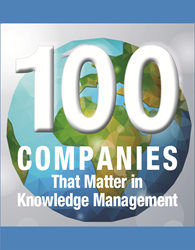 Franz Inc., an early innovator in Artificial Intelligence and leading supplier of Semantic Graph Database technology, today announced that is has been named to KMWorld’s 2016 list of the ‘100 Companies That Matter in Knowledge Management’. “KMWorld recognizes the knowledge economy’s growth will be facilitated by easily combining disparate information enterprise wide,” said Dr. Jans Aasman, CEO, Franz Inc. “With the semantic flexibility of AllegroGraph, integrating knowledge bases is virtually effortless, since the data can remain in its original databases and database designers do not have to create a schema up front. In today's data-driven environments, the ability to quickly analyze data from diverse sources, both public and private, is proving particularly useful to provide unique knowledge rich analytics. AllegroGraph has been widely recognized and endorsed within the industry as the popularity of Graph databases has skyrocketed - growing nearly 500% in the past two years. AllegroGraph was recently named a 'Leading Database Solution' by CIOReview, awarded 'Best in Semantic Web Technology & Leader in Graph Database Products' by Corporate America, PharmaTech Outlook has named Franz a 'Top Ten Solution Provider', and Bloor Research positioned AllegroGraph as a ‘Champion’. Unlike traditional relational databases or Property Graph Databases, AllegroGraph employs semantic graph technologies that process data with contextual and conceptual intelligence. AllegroGraph is able run queries of unprecedented complexity to support predictive analytics that help organizations make more informed, real-time decisions. AllegroGraph is the first Graph Database to support analysis across N-dimensions - any conceivable measurement of an object, property or operation. AllegroGraph can analyze temporal (time) and geospatial (location) dimensions relative to any 'event,' such as a disease, drug interaction, genetic combination, biomarkers, observations, image or physical sensors. AllegroGraph is utilized by dozens of the top F500 companies worldwide.